Can we make it faster? – Yes! Can we pre-fab more of the aircraft? – Yes! Can we leverage new FAI rules in our favor? – Yes! Can we accommodate more than 2KWs? – Sounds like fun! Can we break the sound barrier? – umm, seriously? Wipers on the Tail Too! 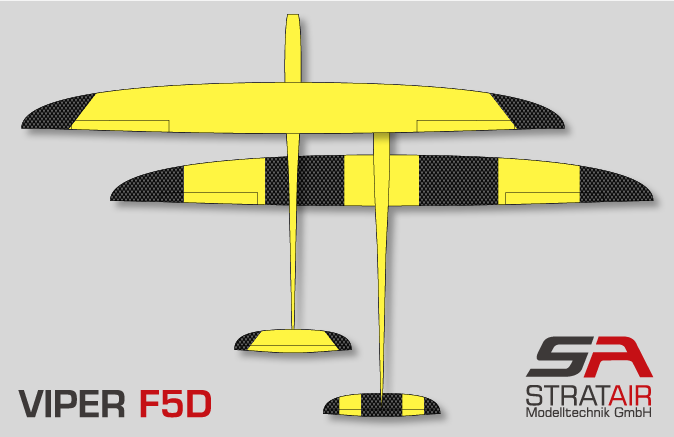 Extended Nose for Larger Props (up to 15 in) !! Larger fuse for more juice! The wing is built around a carbon wrapped main spar, as well as rohacell, plus ribs were added for torsional strength. The fuse sports a primarily kevlar nose with just a couple of carefully placed carbon rovings for a 2.4Ghz friendly nose that can take a high output power plant. The large fuse can take batteries up to 42mm tall, and 35mm wide. Motors up to 28mm will just drop right in there (you’ll want a 30mm spinner for the nose). The reports are in. All the planning worked. The Viper is very fast, very quiet, and tracks like mad!